On October 12, 2018, Funds For Learning president, Cathy Cruzan, co-presented E-rate Appeals and Audits at the SHLB 8th Annual Conference in Washington D.C. Join her and John Harrington on October 23 to hear their presentations and receive a special recap of the SHLB conference. Applicants are working hard to get new E-rate funding to support their broadband projects; but rules are forcing them to pay back funds they received years ago. This squeezes school and library budgets and makes their missions that much harder. Applicants need assistance, not more hurdles. Below is more information about this phenomenon and best practices that can help your school or library system avoid having to give back money for broadband connections that you have already received. 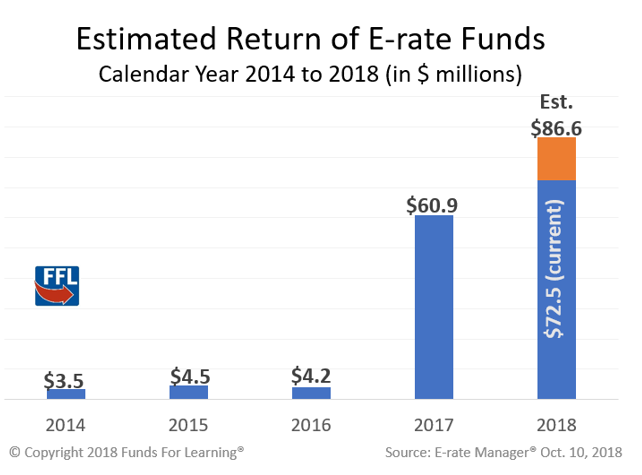 In 2017, E-rate applicants were forced to return over $60 million in disbursed E-rate funds for compliance issues discovered through old, long-closed audits and other program reviews. This amount was nearly three-and-a-half times the amount recovered from the previous four years combined. In 2018, the total repayments requested could exceed $86 million. One possible reason for the uptick was the release of the Net 56 Order on January 17, 2017. In this order, the FCC clarified three issues regarding appeals that have had a major impact on the number of commitment adjustments and funds returned to the program. First, the order established that there is no time limit on the recovery of E-rate funds. While the Fifth Report and Order that inquiries related to wrongful E-rate program disbursements should be completed within five years, the FCC said that this time frame was “a policy preference and not an absolute bar to recovery”. Second, the FCC reiterated the Commission’s duty to “safeguard against waste, fraud, and abuse” of E-rate funds sating that they “will not construe the Commission’s administrative policy for completing inquiries expeditiously in a way that would impair the Commission’s ability to fulfill its statutory obligation to establish and collect its debts”. Thirdly, the Order makes clear that there is no statute of limitations in E-rate, making a clear distinction between policy and an established statute of limitations. With the release of this order, there was a clear spike in the number of commitment adjustments and dollars returned to the program. From 2016 to 2017, there was a 147 percent increase in COMADs and a staggering 1,450 percent increase in the amount of funds returned to the program. USAC issued hundreds of Commitment Adjustment Decision Notifications to E-rate applicants for reviews dating back to as far as 2003. Given that USAC now has explicit authority to recover disputed funds from any point in the program’s history, applicants need be prepared for any E-rate review – knowing what to expect from the most common reviews and best practices for successfully navigating them. SRIR: Selective Review Information Request (SRIR) are more in-depth, but more singularly focused than their PIA counterparts. Select Reviews are focused primarily on the competitive bidding process for a given funding year. Applicants will be expected to validate their competitive bidding procedures, providing copies of bids and bid evaluations. Failing a selective review will undoubtedly result in a commitment adjustment and possibly an audit. PQA: Payment Quality Assurance (PQA) is a post-commitment, post-payment review. In this review, USAC is looking for improper payments. Much like selective reviews, PQA’s are narrow in scope, for very deep in requirements. Applicants will need to provide copies of all the invoices associated with the disbursement or time frame, addresses of the sites receiving the service, a breakout of eligible and ineligible charges, bid evaluation worksheets, contracts, proof of payment, proof of CIPA compliance (if the request included internet access), and list of the make, model, and other relevant information of applicable equipment. Much like the SRIR, failing this review will result in a COMAD and possibly an audit. Knowing the types of reviews and what to expect is important, but there are steps that applicants can proactively take to help these reviews go as smoothly and quickly as possible. Be Responsive: When the requests for information come in, confirm receipt and the due date. If you are going to be out of the office, establish a contact to respond to any E-rate related inquiries. Establish a summer contact in event something comes in during the summer months. If you need more time to respond to a review, ask for it. Be Proactive: Always be ready for a review. Applicants should know where their E-rate documentation is and be ready to respond. Keep folders for E-rate documentation and sort the items by type e.g. bids, service provider correspondence, applications, invoices, etc. Save Everything: The program’s Document Retention Policy is 10 years from the last date of service. So, if you had a contract that was for five years, you need to save that contract for 10 years after the end of the 5-year contract period. Keeping items for potentially 15 years (or longer) can be burdensome, but it is important that an applicant be able to produce the information when they are asked to do so. While most reviews are unavoidable, applicants can decrease the stress and uncertainty associated with them by being prepared and ready to provide the requested information in a timely manner.